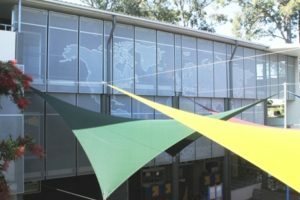 The builder and architect who were currently onsite undertaking other works were approached by the school to design & construct a feature screen to walkways and verandas on the Middle School buildings. 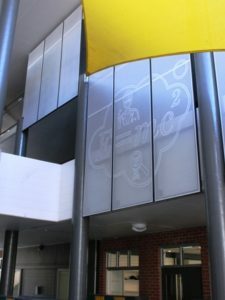 An initial design utilizing a woven mesh product was first suggested but due to costing restraints they started looking at other options such as perforated and laser cut powder-coated aluminium sheets. 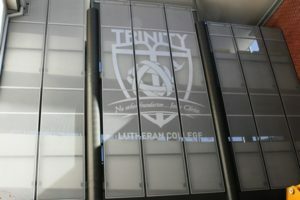 Over 4-5 months various concepts/designs were looked at until a final design was proposed in ‘picture perforated sheet’ that would fit within the school’s budget constraints and to also represent the school’s ethos. Edge Concepts created a structural design to accommodate the perforated sheet as well as providing edge protection to the common walkways and verandas, complying with the Australian Standard AS1170. We are proud to present the final result after a lengthy collaboration with the school, builder, architect and the team at Edge Concepts (Qld) Pty Ltd.